Back in November last year, ZTE said that the Nougat update for the Axon 7 will be rolled out in January. 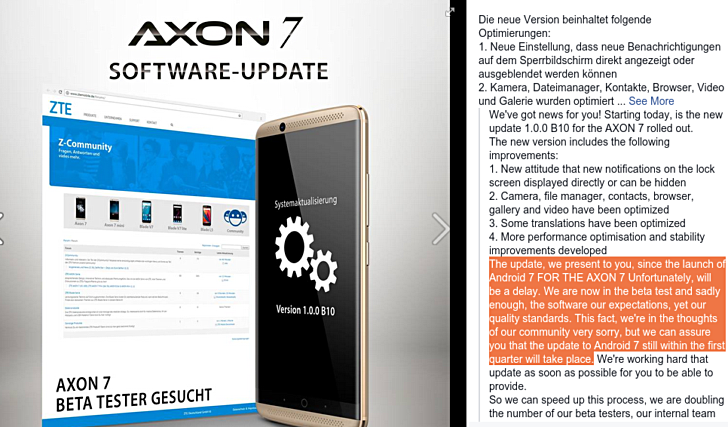 Following this, the Chinese company even launched Axon 7 Nougat beta programs in Germany and the US. However, it has now been revealed that the update has been delayed. According to a Facebook post from ZTE Germany, the update won't be coming this month, but will be made available sometime in Q1, meaning either in February or March. The company says the software in its current state doesn't meet their "quality standards." The beta testing, meanwhile, will continue. In fact, the company is doubling the number of beta testers so that the final rollout can happen as soon as possible. I just ordered 1 from Amazon UK with a 2 year warranty. I don't think the big carriers want to get involved with this because of it's cost. The ability to be able to actually buy one in the UK would be nice ! (I've contacted ZTE about availability in the UK, they basically said they've no idea if it will ever be available).